This is a quick and simple recipe that's nice to have on hand when you want something hot and hearty for dinner. It was developed by Rachael Ray and my version of it closely resembles hers. I had originally intended to have a light supper tonight, but it appears that winter missed the memo regarding the arrival of spring, and, as the day turned stormy and cold, a heavier meal seemed more appropriate. 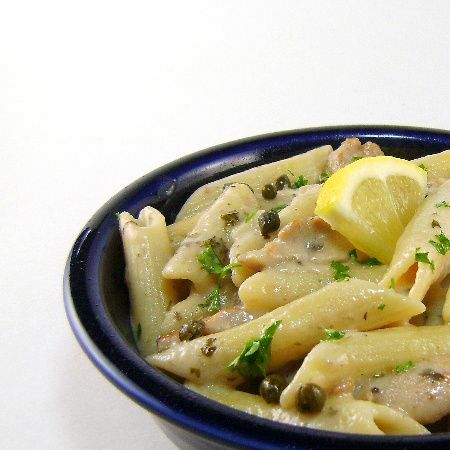 So, water for pasta was put to boil, and chicken, originally intended for the grill, was chopped, and then sauteed with lemons and capers to form a light pasta sauce. This truly is a 30 minutes meal and the recipe is structured to allow you a couple of options. Lemon can be adjusted to personal taste and olives can be swapped for capers if you prefer them. While I used penne this evening, any pasta clearly will work here. Leftovers, while problematic, require special handling. The pasta absorbs the sauce, so, I add a can of mushroom soup when I reheat it. It really works quite well and day two pasta , while slightly different, is as tasty as the original meal. This is simple, hearty and a great fall back recipe. It won't appear on anyone's bucket list or be your final meal request, but it is nice to have on hand for dinner when you are very busy. Here's the recipe.